My first attempt at designing my own magnetic clasps had mixed results. When it came time to epoxy the magnets in place, there were more failures than successes. But I learned a LOT! 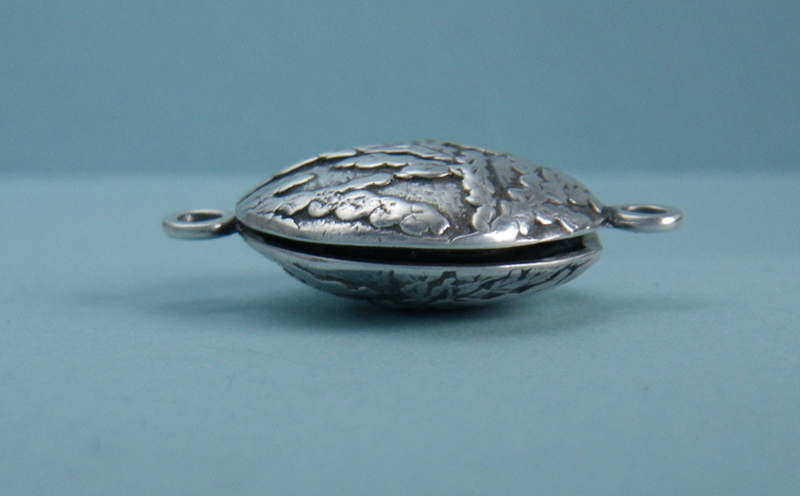 I followed the instructions from Hattie Sanderson’s Maglette kit, and I fully expected that the fired metal clay would shrink to the right size to hold the magnet in place and close the clasp. What I did not think about was the fact that the clay might shrink too much and the magnets would show. I fired the pieces for 2 hours at 1650º to insure the most strength in the clasps. I now know that there is more shrinkage than I am used to when I fire pieces this way. It might be a good idea to design a little collar, for one side of the clasp to overlap the other. That would insure the magnet coverage, even with the clay shrinkage. 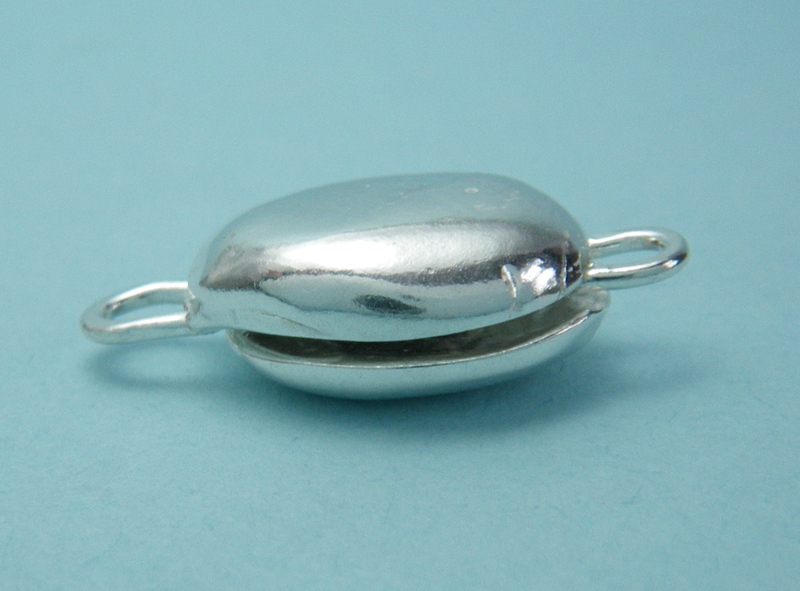 Below, an example of putting one of the magnets in upside down. Duh. 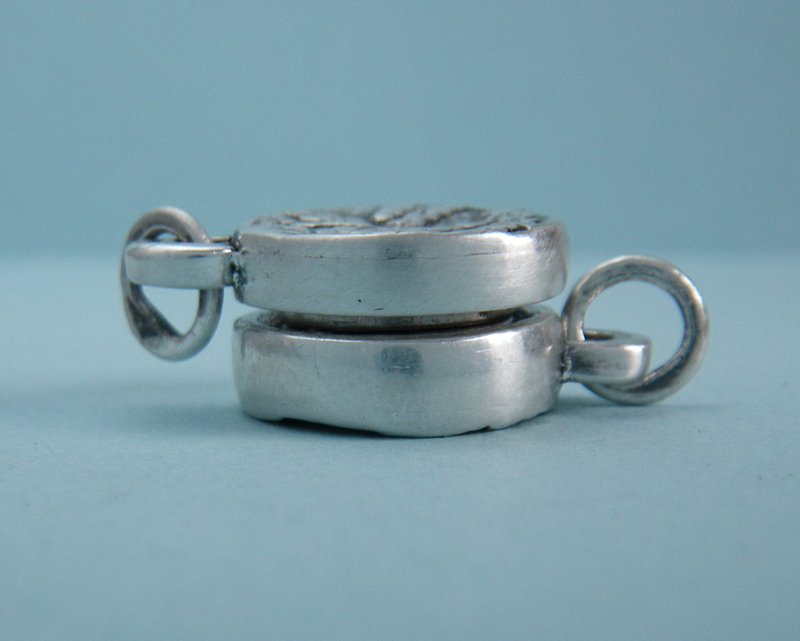 The clasp could not close because the two magnets repelled each other. Below, again with too much shrinkage to accommodate the magnets. (These strong magnets are pretty thin by the way.) 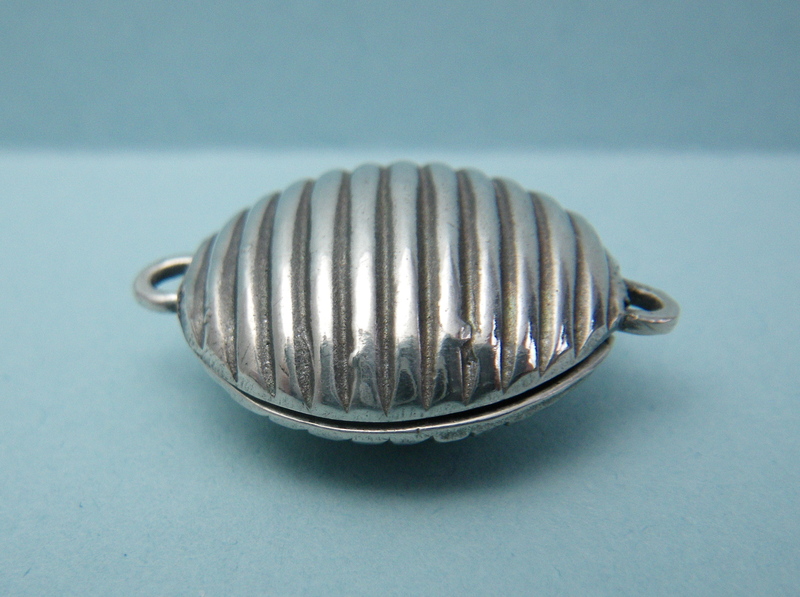 These clasps made me think about having mussels or clams for dinner sometime soon. So, back to the drawing board. Necklaces with a magnetic clasp are one of my best sellers. Especially for people with arthritis. Undaunted, I will work on improving these designs! Also, with the one lentil bead clasp that did work, it is hard to unclasp! I think it will put a lot of strain on the loop or the stringing material when trying to unfasten it. Next time I will make a sturdier loop with a fused jump ring in place. So, I have a few design flaws to work out. Actually, the nubby locking system works fine. That part of the clasp came out as planned. That’s why I was so surprised when they didn’t just shrink to fit the magnet, but went beyond that shrinkage point. One last thing, (to test your attention span at reading a blog comment…) the “dry” attaching system that Kate talks about in her book worked great. Like soldering or fusing, you need to have the two pieces fit well against each other, first. No gaps. But then wet each edge, and rub them against each other until you feel them “catch” and ta da. A surface bond without using more porous slip! i’m so nervous about that no-slip joint (i pass the test! i so look forward to “hearing” your words, i wouldn’t skip one for anything!) since you’ve found it to work, i’ll be more likely to use it. i do like the re-positioning flexibility of slip; i never put things in the right spot to begin with! interesting, about the strength of the magnets requiring a really strong loop/stringing material connection….hadn’t thought of that…. I made a few test pieces last night for the dry attach. They were 4 cards thick. So, that’s thiner than the little knobs I put on the side of the mag. clasps. I plan to bend them a bit to really test them. I’ll let you know. About the magnets and the stringing, I was thinking that a fused jump ring would be good to have in all my clasps to take the strain off the pulling and twisting of the stringing material. Missing you a lot today. You’re still going to Purdue, right? i’m missing you, too….it’s a snow day…i wish we could be working together….. I was in desperate search of info on making magnetic clasps with PMC3 and I found this thread. I also had a major “whoops,” one that (apparently) has not darkened your door. I made a clasp without using Maglettes — just neodymium N42 discs — and didn’t think to put any type of mechanical grip between the two halves. 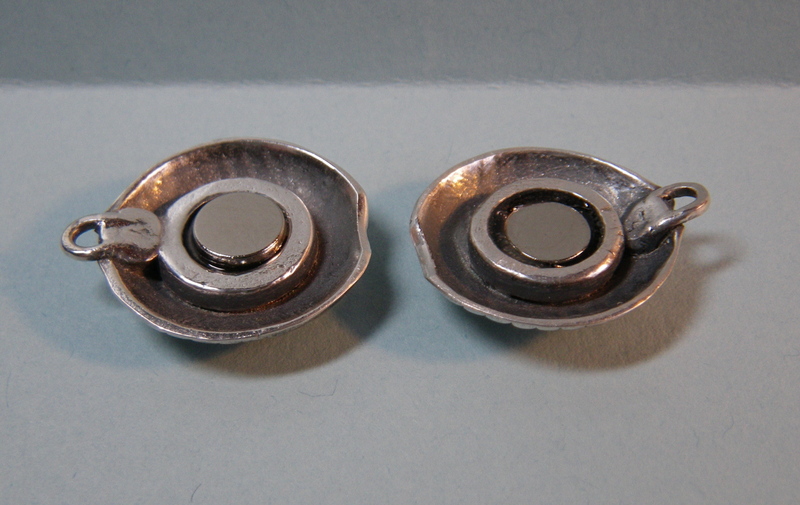 The problem was that the halves would slip apart (side-to-side) given the weight of the watch bracelet. I didn’t discover the flaw until the magnets were already expoxied in and the beading was completed. Hmm, to late to refire; I brilliantly thought to embed a small headpin in a recessed area on one half using epoxy (too late to solder…). When drilling the pilot hole in the other half of the clasp using a Dremel, the component predictably heated up. I kept iterating, drilling deeper, fitting together, drilling even deeper, and so on. One final fitting and I found that the clasp wouldn’t stay together. Well, it turns out that neodymium is heat sensitive, and by overheating the magnet with the Dremel, I rendered it attraction-less. I was stunned to find out that the clasp was now totally useless and pretty ugly as well! In doing a bit of research, I looked at http://www.kjmagnetics.com and their FAQ section clearly states that neodymium is heat senstive. DOH! So all you magnetic clasp wanna-do’s, DON’T heat up your magnets. What a moron! PS this item was for personal use so I was ready to experiment. Good thing. Sorry to hear your tale of woe. It sounds like I am in good company! 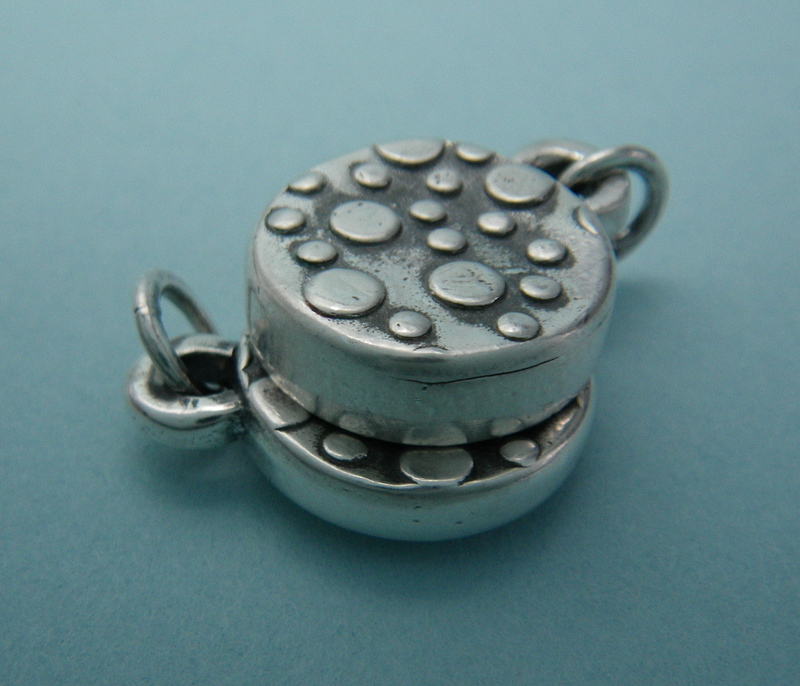 I haven’t tried to make any magnet clasps for a while, but when I design them in my head they all have a little pin fired in place so it will be some kind of locking mechanism to keep the magnets from sliding. Good to know your advice about not heating up the magnets!